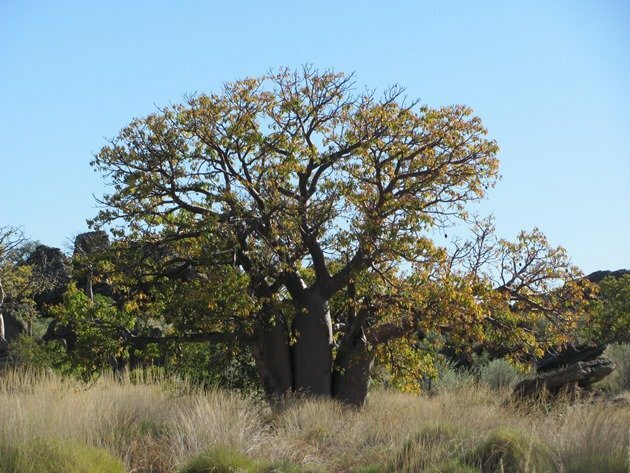 Although there are Boab trees in Broome you do need to head further north in the Kimberley to find them in large numbers and they really are impressive trees. Once you reach the small town of Derby they line the main street and as you travel along the Gibb River Road you will discover that they come in all shapes and sizes. 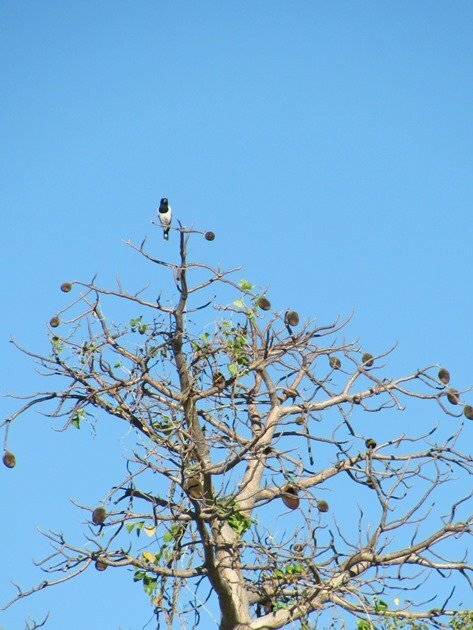 It really is the iconic tree that defines the Kimberley and at this time of year most of the trees are just starting to sprout new leaves and their large nuts hang down from the empty branches. 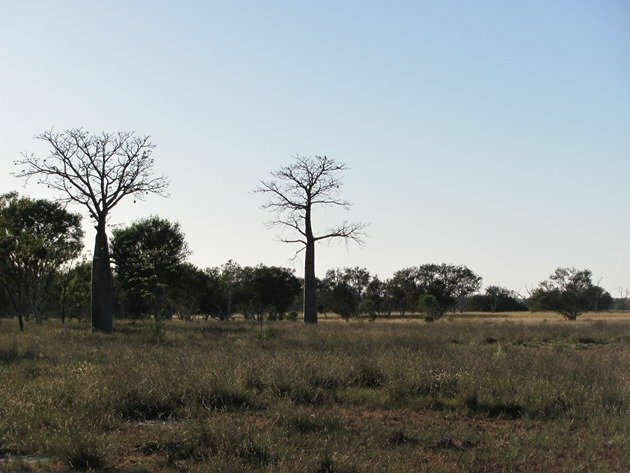 The birds love to get to the top of these trees and look out across the never-ending landscape of the Kimberley. We recently took a nine day trip into the bush venturing north to Derby and then along the Gibb River Road about 160 kilometres to a water course where we suspected there may still be water. We then back-tracked to go to Windjana Gorge and Geikie Gorge and then travelled back west towards Broome checking out some other birding hotspots along the way. Most of this trip was in remote areas well out of phone range and you need to be entirely self-sufficient. Birdlife may guide you to water, but it would be unwise to travel without ample supplies and we carried 50 litres of drinking water and a bucket with a long rope to collect water where there may by crocodiles present. On our first night away from home we were south of Derby and there was an impressive Boab tree and around its base there were numerous White-winged Trillers and Crimson Chats feeding in the long grass. It was impossible to photograph them as they moved forward as we did, but the Boab is impressive never-the-less. 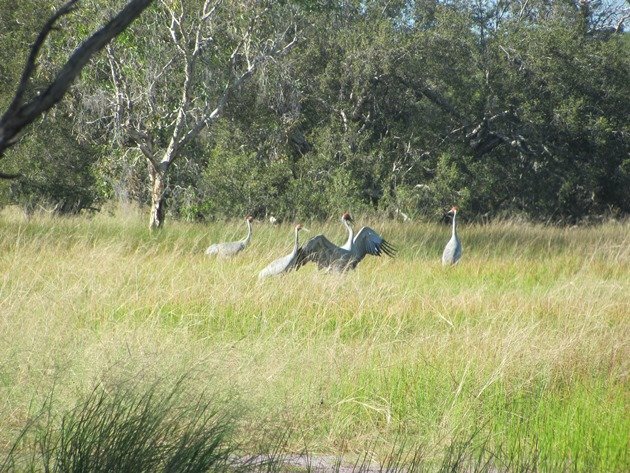 We went to sleep to the sound of Brolga honking! The Galahs were also taking advantage of the early morning light in the top of the Boab trees and were gathering together in quite large flocks. We travelled along the Gibb River Road until we came to a water course that we have visited a few times over the years and the amount of water present has often varied. 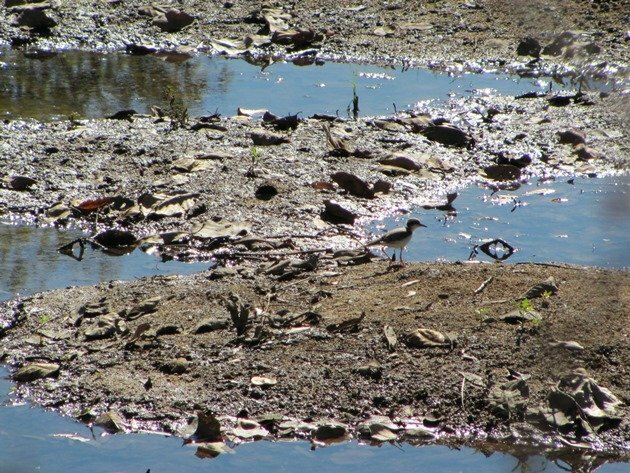 It does not take a lot of water to sustain birdlife in these remote areas and the pools that remained were small, but productive for a variety of birdlife. 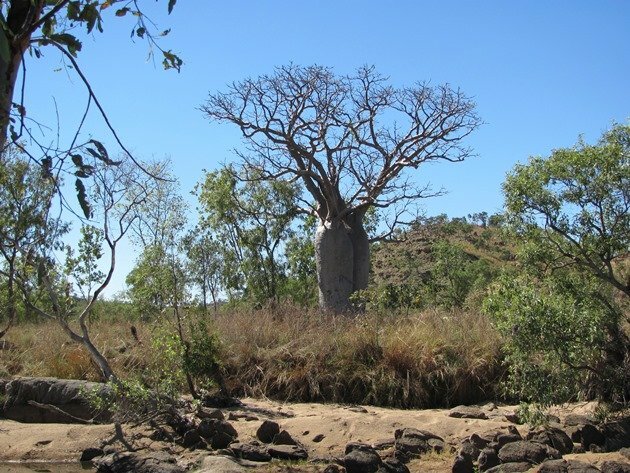 Boab trees lined the water course and a variety of other native trees with denser foliage, which invariably held some surprising birds. We accidentally flushed a Nankeen Night-heron, White-faced Heron and an Australasian Darter in an area where you would not necessarily expect to find them, due to the minimal water present. A Radjah Shelduck flew over noisily and surprised us and was obviously looking for a larger water body. There was a huge variety of finches present in the long grass at the edge of the water course and the most vocal were the Crimson Finch. Of interest was a lone juvenile Black-fronted Dotterel that remained alone until dusk feeding along the water’s edge. As the sun dropped below the horizon we heard and then saw its parents return and they stayed as a family throughout the night. It was not a quiet camp because the Bush Stone-curlews were wailing as soon as the sun had set! One of our other camps in the bush was impressively surrounded by more Boab trees and there was one rather large tree that still had leaves present. It appeared as three trees combined and this is not uncommon. 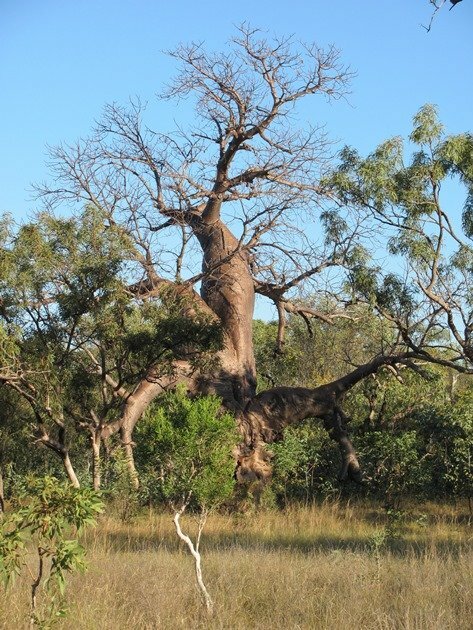 The Boab trees are often in pairs and sometimes twisted together. 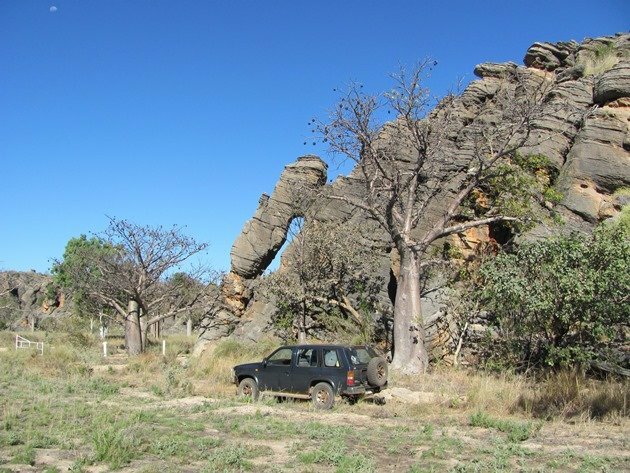 We chose a camp near here with impressive rock formations, Boab trees and of course some noisy birdlife! There were over 20 Great Bowerbirds busy collecting native figs from the nearby trees and no doubt anything else that may be useful in attracting a mate. The Pied Butcherbirds were using the height of the Boab trees and the surrounding rock faces to their advantage and were vocal early the following day. 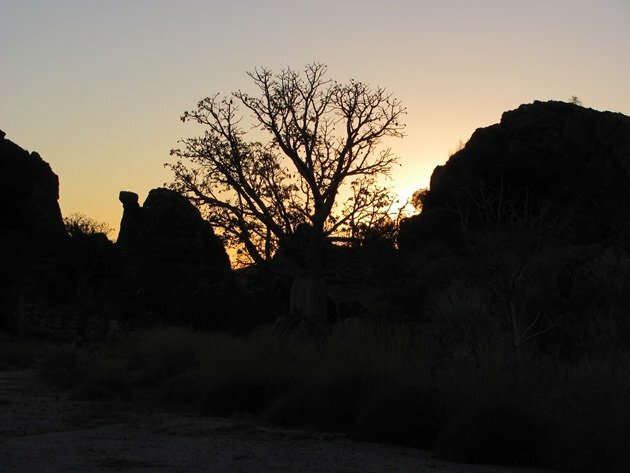 We had the pleasure of a sunrise behind a Boab tree before the silence was broken! Of course the most picturesque bathrooms in the Kimberley are the temporary ones you make for yourself. You have side mirrors on your car if you need to shave and you can carry your own bucket and water. There is a much greater appreciation of the value of water when you need to consider how much you have and how much you really need to use. You will be surprised how little you can really use to get really clean when you are not just standing under a fast running shower! You may also be surprised to know that you can survive without electricity, television, radio, mobile phones and many other things that we often take for granted. You will also soon realise that the smartest thing to do is go to bed as soon as the birdlife quietens down…if it does….because it will wake you up bright and early the next day. 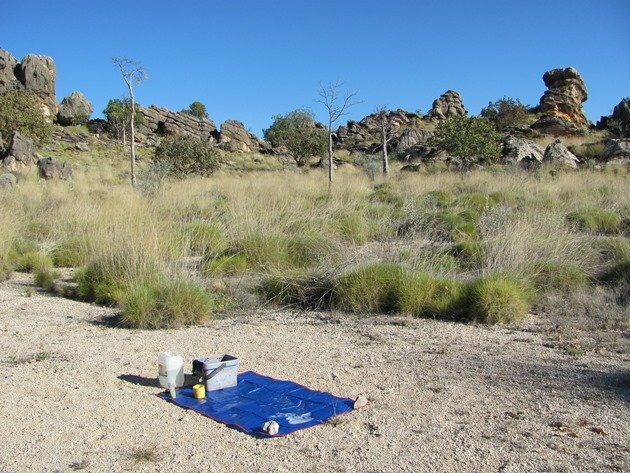 Is that spinifex next to the bathroom? And if so, have you checked it for footprints and poop of Nightparrots? Hi Pablo….it is believed that our Boabs may have originated from African Baobabs many thousands of years ago.